The GLITZKOIN ICO came to a successful conclusion and the bounty program was cruising along. Weeks before the end of the bounty program, the tech team revealed some disturbing information. Apparently the bounty records maintained by program participants, were attacked by Russian scammers. While this did cause some confusion and misunderstanding among bounty participants, the modus operandi of the Russian scam threw up some serious issues. GLITZKOIN administrators and promoters, were threatened with dire consequences, if substantial amounts of money in the form of ETH or BTC (crypto tokens) were not transferred to the scammers. The scam artists threatened to initiate a massive negative campaign against the GLITZKOIN project. Initial messages were sent across in Russian, these subsequently appeared as loosely translated English messages. It was quite clear that the scammers had a fairly good knowledge about blockchain and crypto currencies. 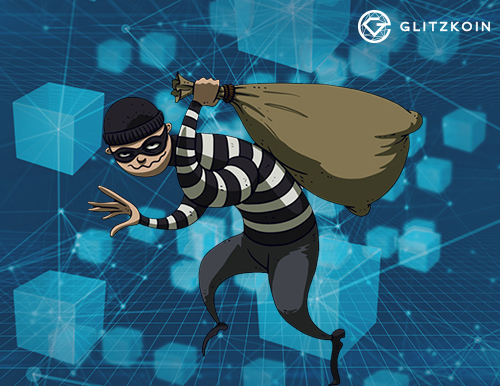 Technical experts pointed out that, the scammers took advantage of the fact that, it would be virtually impossible for GLITZKOIN to track them down. After hours of deliberation the GLITZKOIN team came up with the resolution that, it would not give in to the demands of the Russian scammers. It was also decided that details of the scammers would not be made public, this to comply with privacy laws implemented by various nations. The possibility that the scammers were using hacked accounts, could also not be ignored. Data related to the bounty program that could be retrieved and audited, was used to share bounty rewards among all participants. Probably not the fairest of ways but surely, the only feasible option. GLITZKOIN is not the sole target of crypto scammers and blackmailers. The first half of 2018, threw up some alarming crypto based scams. The reputed news channel CNBC reported a blackmail scam where, affluent Americans where being blackmailed into transferring Bitcoin tokens to the scammers. At around the same time, the FBI warned investors about another crypto based scam where, investors were being forced to pay penalties using popular crypto currencies as the mode of payment. The scam that GLITZKOIN faced should be an eye opener for the crypto world. While blockchain and crypto currency are evolving and gradually making a positive impact on world economies, the dark side of these sparsely understood technologies is beginning to show its ugly face. What is called for is an effective legislation that, will make it possible for crypto scammers to be tracked and brought to justice. Interestingly one of the prominent features of this technology is decentralization, the lack of a single governing authority. This might pose a challenge to law enforcers and needs to be addressed. So are we advocating a drastic change in the basic concepts, that form the foundation of blockchain and digital currency. This is something that needs to be debated on a larger platform, safety and privacy need to be balanced. In any case, wild growth might not be in the best interest of stakeholders.